Antipsychotics are unique drugs with the ability to alter how people think and communicate. As a result, physicians must weigh a range of implications when prescribing antipsychotics. Antipsychotics: History, Science, and Issues offers a robust explanation of antipsychotic medications that covers the historical, ethical, medical, legal, and scientific dimensions of antipsychotics. 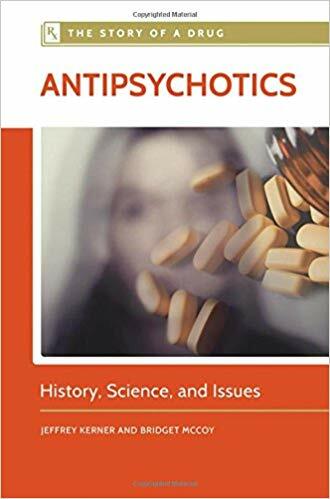 The chapters explore topics ranging from the science of how examples of this class of drug actually work in the body to the social and legal implications of antipsychotics, making this subject understandable and relatable for lay readers who are not mental health practitioners. Readers will learn why prescribing antipsychotics is often a difficult decision due to the inherent risks of giving these medications to different types of patients and appreciate how mental health laws impact psychiatrists’ prescribing practices. 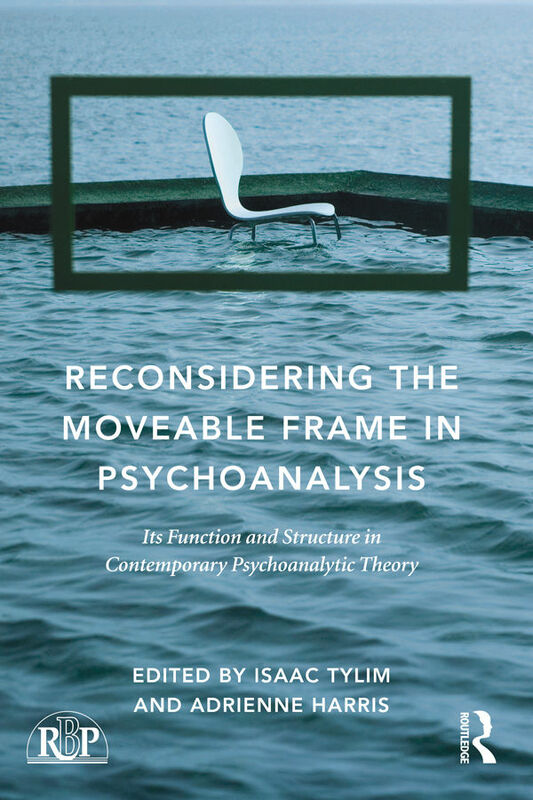 Reconsidering the Moveable Frame in Psychoanalysis explores the idea of ‘the frame’ at a time when this concept is undergoing both systematic revival and widespread transformation. It has always been tempting to see the frame as a relatively static, finite and definable feature of psychoanalytic work. At its most basic, the frame establishes agreed upon conditions of undertaking psychoanalytic work. But as this book shows, the frame has taken on a protean quality. It is sometimes a source of stability and sometimes a site of ethical regulation or discipline. It can be a place of imaginative mobility, and in certain analytic hands, a device for psychic work on projections and disavowals. Beginning with a seminal essay on the frame by José Bleger, this book includes commentary on that work and proceeds to explorations of the frame across different psychoanalytic theories. The frame is perhaps one of the spots in psychoanalysis where psyche and world come into contact, a place where the psychoanalytic project is both protected and challenged. Inevitably, extra-transferential forces intrude onto the psychoanalytic frame, rendering it flexible and fluid. Psychoanalysts and analysands, supervisors and candidates are relying increasingly on virtual communication, a development that has effected significant revisions of the classical psychoanalytic frame. This book presents a dialogue among distinct and different voices. It re-examines the state and status of the frame, searching for its limits and sifting through its unexpected contents whilst expanding upon the meaning, purview and state of the frame. 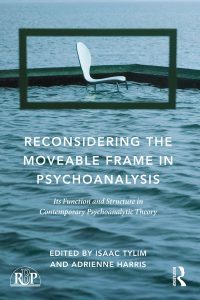 Reconsidering the Moveable Frame in Psychoanalysis will appeal to all psychoanalysts and psychoanalytic psychotherapists interested in how best to understand the frame and to use it most effectively in their clinical practice. “This absorbing new volume is a compelling journey through the brave new world of psychoanalysis as it is practiced in the 21st century. Co-editors Isaac Tylim and Adrienne Harris have chosen to begin their excursion with the classic work of Bleger on the analytic frame. From there the contributors span the globe, both in the geographical and the theoretical sense, bringing to bear diverse views of where we stand today in considering the structure of the psychoanalytic dialogue. What makes it work? What impinges on our work? The influence of cyberspace is extensively considered, reminding us that the world around us has changed, and the analytic process can no longer remain insulated from these changes. I heartily recommend this superb new collection of essays as a brilliant and provocative contribution to our understanding of the fundamental components of the analytic situation.”-Glen O. Gabbard, MD, former Joint Editor-in-Chief, International Journal of Psychoanalysis. Isaac Tylim, Psy.D., ABPP, FIPA, is a Training and Supervising analyst at the Institute for Psychoanalytic Training and Research (IPTAR). He is a clinical professor, training analyst and consultant for the New York University Postdoctoral Program in Psychotherapy and Psychoanalysis. The revised 13th edition of the essential reference for the prescribing of drugs for patients with mental health disorders. The revised and updated 13th edition of The Maudsley Prescribing Guidelines in Psychiatry provides up-to-date information, expert guidance on prescribing practice in mental health, including drug choice, treatment of adverse effects and how to augment or switch medications. 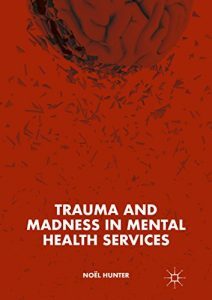 The text covers a wide range of topics including pharmacological interventions for schizophrenia, bipolar disorder, depression and anxiety, and many other less common conditions. There is advice on prescribing in children and adolescents, in substance misuse and in special patient groups. 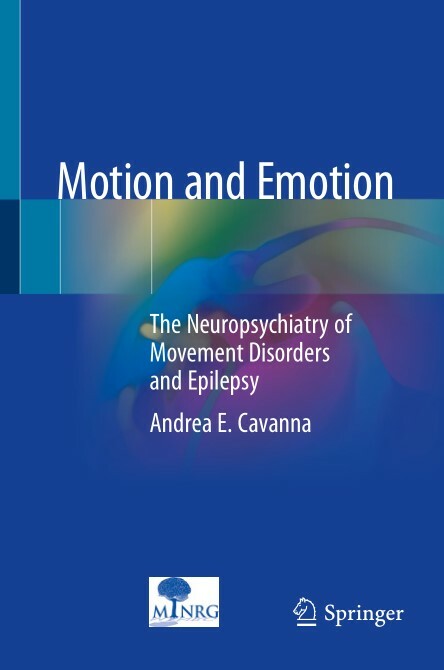 – Includes referenced information on topics such as transferring from one medication to another, prescribing psychotropic medications during pregnancy or breastfeeding, and treating patients with comorbid physical conditions, including impaired renal or hepatic function. 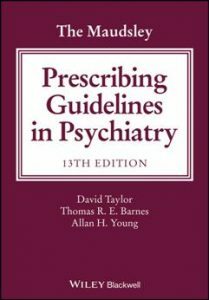 Written for psychiatrists, neuropharmacologists, pharmacists and clinical psychologists as well as nurses and medical trainees, The Maudsley Prescribing Guidelines in Psychiatry are the established reference source for ensuring the safe and effective use of medications for patients presenting with mental health problems. 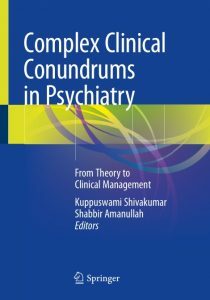 This book provides the readers with a series of complex cases that are organized by psychiatric disorder. Written by experts in the field, the cases offer insight on how to navigate care in delicate situations while considering preexisting medical conditions. Topics cover pharmacological concerns in women who are pregnant or nursing, working with dementia patients suffering from HIV, assessing and treating ADHD in special populations, monitoring medication use in patience recovering from Substance Use Disorder, and working with patients suffering from personality disorders. Each chapter offers guidance through the maze of classifications, clinical features, diagnosis and various complex interventions. The book also covers new information on the advances in research and management aspects. 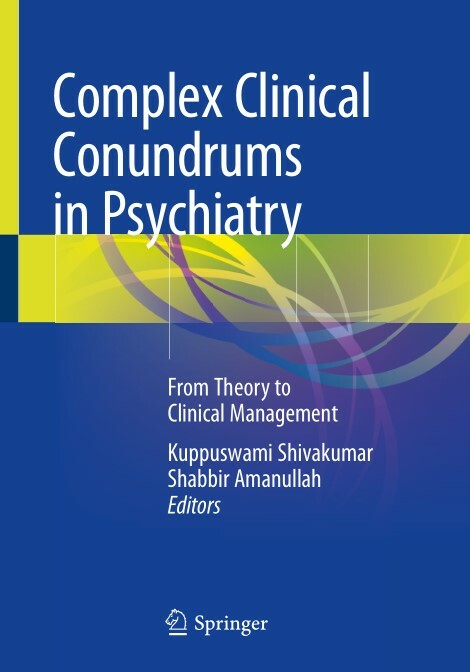 Complex Clinical Conundrums in Psychiatry is a valuable resource for psychiatrists, psychologists, family physicians, geriatricians, counselors, social workers, nurses, and all medical professionals working with complex psychiatric patients. 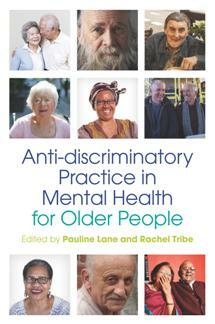 Exploring the key issues around anti-discriminatory practice for professionals working in mental health services, this book looks at ways to improve the health and social care of older people from minority and excluded communities. The chapters explore the issues involved in working with individuals from a range of minority groups, such as LGBT people, people with learning disabilities, people from black and minority ethnic communities, homeless people and people with dementia. The chapters cover important theory and research into discrimination, ageing and identity. Contributions from experts in the fields of mental health and working with minority groups provide practical insights into developing anti-discriminatory practice.There is also practical advice on culturally appropriate support for carers, cultural competency in end of life care, working with interpreters, and celebrating diversity, accompanied by supporting practical resources. 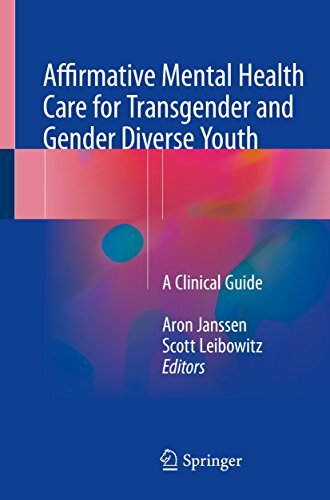 This comprehensive book will provide mental health practitioners and students with an essential understanding of anti-discriminatory practice. This unique resource offers an in-depth, comprehensive look at different types of mental health needs of transgender and gender diverse youth, how these intersect with gender identity, gender expression, and sexual orientation, and provides practical information on how to ethically, responsibly, and sensitively care for these patients. 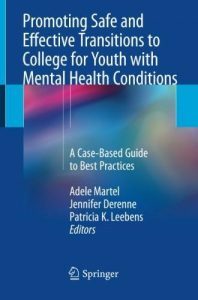 This concise and practical book provides an overview of how to safely and effectively transition adolescents with mental health conditions into a college environment. Therapeutic strategies to assess and promote readiness for transition to college are discussed in case-based chapters, which include case history, analysis of transition, clinical pearls, literature review, and helpful resources for clinicians, patients, and families. 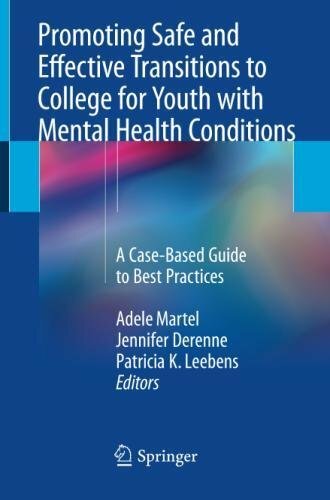 Filling a significant gap in the literature, Promoting Safe and Effective Transitions to College for Youth with Mental Health Conditions: A Case-Based Guide to Best Practices delivers essential information for psychiatrists, psychologists, and other mental health professionals who work with children, adolescents, and their families before, during, and after the transition to college. How do survivors of child abuse, bullying, chronic oppression and discrimination, and other developmental traumas adapt to such unimaginable situations? It is taken for granted that experiences such as hearing voices, altered states of consciousness, dissociative states, lack of trust, and intense emotions are inherently problematic. But what does the evidence actually show? And how much do we still need to learn? Mental health has long been perceived as a taboo subject in the UK, so much so that mental health services have been marginalised within health and social care. There is even more serious neglect of the specific issues faced by different ethnic minorities. 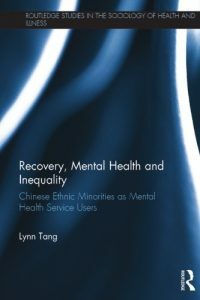 This book uses the rich narratives of the recovery journeys of Chinese mental health service users in the UK – a perceived ‘hard-to-reach group’ and largely invisible in mental health literature – to illustrate the myriad ways that social inequalities such as class, ethnicity and gender contribute to service users’ distress and mental ill-health, as well as shape their subsequent recovery journeys. Recovery, Mental Health and Inequality contributes to the debate about the implementation of ‘recovery approach’ in mental health services and demonstrates the importance of tackling structural inequalities in facilitating meaningful recovery. 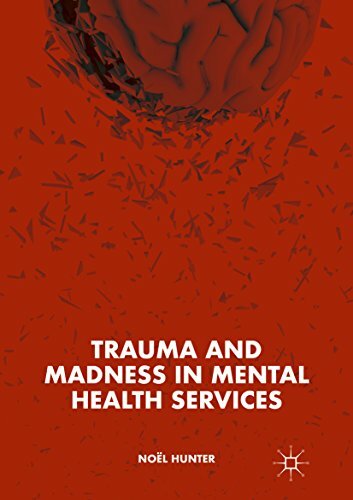 This timely book would benefit practitioners and students in various fields, such as nurses, social workers and mental health postgraduate trainees.